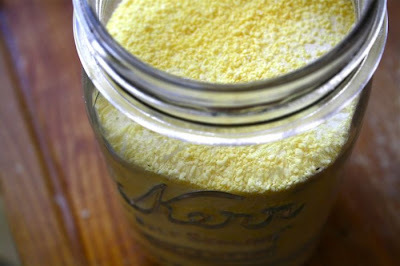 Over the last few years, I've read about others making their own laundry detergent. I'll be honest. I thought they were crazy. I first read about it here, here and more recently here. And yet, I'm trying it too. Why not? It's definitely cheaper to make it yourself, it appears to be easy to make and if it cleans as well (and is better for our machines and our environment), it seems that I'd be stupid not to at least give it a shot. I researched about the pro's and con's. I checked into the reliability with front loading washers, and read more reviews. I mixed it all up, ran it through my food processor to get a finer grain (the soap bars are easy to grate, but I wanted a smaller granule), and then popped it into a plastic pitcher from Wal-mart. (I would have used a glass jar, but I didn't have one large enough available). Easy peasy! 2 tablespoons per load is all it takes and it saves my budget about 20 cents with each load I do (our store bought name brand detergent runs me about $0.29 per load). It took about 30 minutes to make (with grating the soap and all). I'm thinking it's a win/win for us. So far, everything that I've washed has come out just dandy! Toddler hand prints and jazz, towels, and work clothes all look and smell great! Up next... maybe... probably... but not definitely... dishwasher detergent! A funny tidbit... so my sister-in-law Kimberlee, was over while I was mixing everything up and she asked me what I was doing. I explained it... and her first comment was... something to the effect that I've gone "too far" with all of "this" and that I needed to make changes in other places. Once I explained it to her, she didn't think it was THAT strange, but still felt it was odd. I made liquid laundry soap a few months ago and LOVE it! I miss the smell of my other soap, but love how cheap it is and how well it cleans all my kids dirty clothes! My sister thought I was weird too, till I told her how cheap it was and how much it makes. I think I'll have to add some oxi clean to my next batch whenever I run out. Great idea!